Improving your song writing skills through hypnosis can be surprisingly simple if the correct script is chosen. If you or your client is already musically-inclined, but in a situation where the words and music just won't come, all that is left to do is relax and bring out the brilliant writing ability that is buried deep within everyone once this script is put into practice. In order to write songs with ease, in a manner that is appealing and engaging to many, one must learn the skill and hone the art. If you are ready to write songs like a pro, this script is where to start. The lesson will be as easy as sitting back, relaxing, and freeing your imagination. Whether you are interested in unleashing the creativity to write lyrics, or building the "ear" to write the music you have played around with for years, this hypnosis script will help. Often, the challenge in music writing is silencing the superfluous thoughts that are inhibiting your ability to getting the music on paper on a clear and artistic way. The words and music may come too quickly, and it can be difficult to sort out what is needed and what can be thrown aside. When moving through your daily life though, this can be a challenge. When the subconscious and conscious are both battling to be heard, you may feel overwhelmed. Song writing is never as simple as it seems when watching others do it, or when listening to a final product. It is possible though, through the use of hypnosis, to make the words and music come more easily, more artfully, and more succinct. Typically, song writing begins with a few simple notes. From this one tune, melodies grow, and if skilled, you will eventually have a finished piece that appeals to many. This ability to write well flows from the confidence of being a good song writer. This hypnosis script will build that confidence. The script is designed for a musician and it will have you feeling as if you are a skilled and confident song writer. This script will motivate you or your client, and it will open the mind's door to let the words and music flow. This is an intellectual script designed for those that are musicians and who need assistance and focus. If you consider yourself a song writer and you need a push now and again, or if you are new to the music world and you need to build confidence in your new skill, this script will help you or your client. 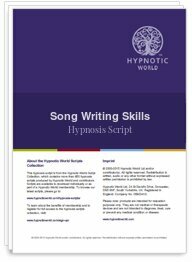 This hypnosis script can help you to feel confident and assured in your song writing and free the constraints that leave you feeling empty of words. Use this script if you are a musician that needs that inspired, motivated feeling that comes over all song writers when they have found their writing zone.